Includes a delicious Butterbeer™ in a souvenir tankard! Warner Bros. Studio Tour London is 5 stars on TripAdvisor with over 26,000 ‘Excellent’ reviews! Available Entry Timeslots: 5:30pm to 7:00pm. Ensure you get the full magical experience with return transportation on a Warner Bros. Studio branded bus! Watch the first instalment of the Harry Potter film franchise, Harry Potter and the Philosopher’s Stone, as you make your way to and from the Studio! 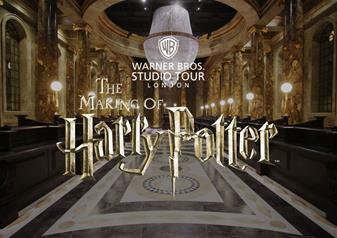 When the doors close to the public on the 20th June 2019, Golden Tours customers will be given the chance to attend an extra-special event at Warner Bros. Studio Tour London – The Making of Harry Potter. You'll even get the chance to meet actor Warwick Davis, who played Professor Flitwick and Griphook in the film series. During this exclusive Warner Bros. Studio Tour London - The Making of Harry Potter event, you will be able to admire authentic sets, props and costumes first created for the film series. Starting at the Cupboard Under the Stairs, your magical evening will begin with an introduction to the tour. As well as the chance to learn wand moves and can ‘fly’ a broomstick like a member of the cast, Golden Tours guests can enjoy experiences that have been specifically added for the evening. Guests can meet the Prop Making team, see how the coins were pressed and discover how the rubberised treasure was created for the vaults. Also learn about green screen technology and animatronics on this special after-hours access to Warner Bros. Studio Tour London. Playing both Professor Flitwick and Griphook in the Harry Potter film series, actor Warwick Davis has also appeared in many films and TV series. Enjoy this unique chance to meet Warwick and learn about his life on set. Enter the all new Gringotts Wizarding Bank on Diagon Alley and discover the magical treasures within. Step into Bellatrix Lestrange’s vault to find the Sword of Gryffindor and Helga Hufflepuff’s Cup, one of Voldemort’s many Horcruxes, before taking a photo surrounded by thousands of pieces of magical treasure. Learn spectacular wand moves with an interactive experience and put your wand combat skills to the test! As part of your evening, you'll also get to take home a special Gringotts' Souvenir Guide Book to remember your experience. The perfect chance to try the drink featured in the Harry Potter film series. The event includes a delicious Butterbeer™ in the Backlot and souvenir tankard! Take a look inside the original Hogwarts Express™, pose for pictures on Platform 9¾™, wander the authentic sets and see detailed costumes and props. Fly on a broomstick with the amazing green screen experience, see incredible animatronics and witness the level of intricacy that went into making the world-famous film series. Explore Dumbledore’s™ office, visit the Gryffindor™ common room, see Harry’s Nimbus 2000™ and take a look at a 20 foot model of Voldemort’s™ snake Nagini. TM & © 2019 Warner Bros. Entertainment Inc. - Harry Potter publishing rights © J.K. Rowling. Entrance time-slots are at 30 min intervals from 5.30pm– 7:00pm. You’re welcome to stay at the Studio Tour until Midnight. Please note, you will receive one Gringotts’ Guide Book per booking, not per guest.